Daredevil Nik Wallenda brought his high-wire act to Maryland Wednesday morning, walking between two buildings at National Harbor. 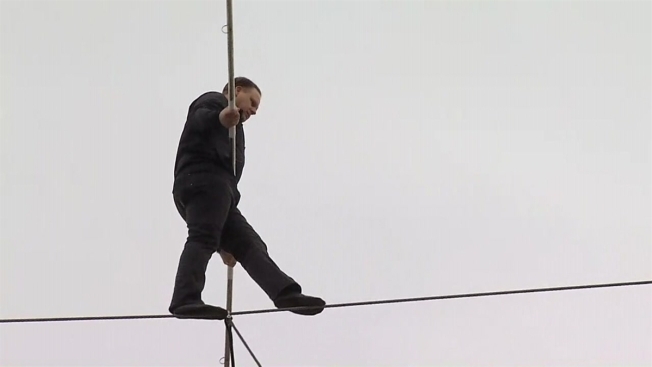 Wallenda used only a balance bar as he walked 75 feet in the air on a cable the diameter of a nickel. The 230-foot walk took Wallenda about four minutes to complete. There was one heart-stopping moment as Wallenda stumbled toward the end of the walk, taking a knee before saying, "Just kidding." When he completed the walk, the crowd erupted in cheers. The death-defying stunt was just a warm-up. Wallenda's high-wire walk is the kick off to the Big Apple Circus, which will open at the National Harbor March 8 and run until April 1. Wallenda holds 10 Guinness World Records for his stunts. He completed his longest tightrope walk ever during an appearance at the Wisconsin State Fair in 2015 and walked across Niagara Falls in 2012.